Local baseball scholar Cory Ritterbusch will step up to the plate with “Regional Baseball History” March 17, a free program, presented by the Galena-Jo Daviess County Historical Society. “Regional Baseball History” starts at 3 p.m. at Galena Middle School, 1230 Franklin St, just a few days before the start of the Major League Baseball season. Expect an entertaining afternoon that will leave listeners eager for summer sun and bleacher seats, hot dogs and the crack of a bat. 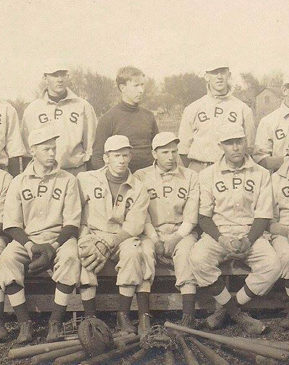 The Galena-Jo Daviess County Historical Society presents “Regional Baseball History” as a “spring training” of sorts for the Galena & U.S. Grant Museum’s upcoming exhibit, “Play Ball!” opening March 30. Ritterbusch has researched regional baseball’s rise in the final decades of the 1800s to its heyday in the first half of the 20th century, when companies and communities sported dozens of teams, from the Galena Greys to the Lead Mine Digging and Drilling Company. He’ll highlight standout athletes and teams, from the Peaches to a Shullsburg team who lost just a single game in a six-year stretch. His niche as a baseball historian is his biographical expertise on Pee Wee Reese, the Brooklyn Dodgers captain best known for welcoming Jackie Robinson onto his team as the first black MLB player. In January, Ritterbusch spoke on Reese at the annual meeting of the Society for American Baseball Research (SABR) at the Louisville Slugger Museum in Louisville, Ky.
Ritterbusch praised historians Don Korte, who wrote “Galena’s Baseball Legacy” and Jim Carter, who wrote “Lafayette County Baseball History.” On March 17, Ritterbusch will also draw significantly on his research in the pages of historical newspapers and in the archives of the Society for American Baseball Research. “Regional Baseball History” is the second-to-last in the Historical Society’s line-up of “History Matters,” sponsored by Illinois Bank & Trust. In the final inning of “History Matters” April 7, Circus World curator Peter Shrake will present “The Silver Man,” on the life and times of John Kinzie, the last Indian agent in Wisconsin. For more information, contact the Galena-Jo Daviess County Historical Society at 815-777-9129 or go to galenahistory.org. Visit the Galena & U.S. Grant Museum at 211 S. Bench St., Galena, IL 61036. For media-related questions, contact Amy Alderman, marketing director, Galena-Jo Daviess County Historical Society by phone at 815-777-9129 or 312-547-9152 or by email at marketing@galenahistorymuseum.org.